Howdy y'all! Happy Monday to you! We celebrated my baby brother's 30th birthday last night. >Sniff< That makes me feel old. This past week we had snow which is something we don't get a whole lot of in Texas - imagine that. So Diva had an unexpected holiday last Monday whereby she got to romp in the snow. That is precious time; being a kid and carefree and just playing and laughing and rolling down hills and freezing your tail off and coming inside for hot chocolate breaks only to go back out and do it all over again. And this week Diva, got the day off for MLK Day so we get to putter today too. I think we should most definitely adopt the four day work week. 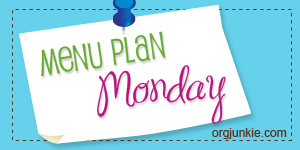 Glad you're having fun playing with all of us at Menu Plan Monday! The recipe is from the 30 Minute Meals cookbook by Rachel Ray and I've added the link above. Enjoy!